Are there chairs hidden in your attic, basement or barn that are too nice to throw away but need new seats? Bring them by and we will restore them back to the useful heirlooms you want them to be. 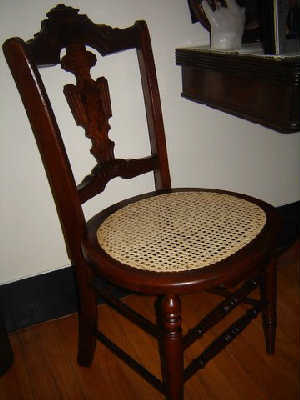 We weave all types of chairs: Standard Cane, Prewoven Cane, Splint Weaving, Rush Weaving, Shaker Tape, Porch Rockers, and Wicker repair. We also reglue chairs and do general structural repair. Please give us a call during regular business hours, or better yet, stop in!